This module is experimental and there are probably bugs - so treat it as alpha and don't use it on production websites. I started on this module because there have been quite a few requests for "fake" or "invisible" parent functionality and I was curious about what is possible given that the idea sort of goes against the PW page structure philosophy. I'm not sure that I will use this module myself, just because I don't really see a long list of pages under Home (or anywhere else) as untidy or cluttered. I would tend to use Lister Pro when I want to see some set of pages as a self-contained group. But maybe others will find it useful. At the moment this module does not manipulate the breadcrumb menu in admin. So when you are editing or adding a virtual child the real location of the page is revealed in the breadcrumb menu. That's because I don't see the point in trying to comprehensively fool users about the real location of pages - I think it's better that they have some understanding of where the pages really are. But I'm open to feedback on this and it is possible to alter the breadcrumbs if there's a consensus that it would be better that way. Allows pages in Page List to be grouped under a virtual parent. This module manipulates the page list and the flyout tree menu to make it appear that one or more pages are children of another page when in fact they are siblings of that page. Why would you do that instead of actually putting the child pages inside the parent? Mainly if you want to avoid adding the parent name as part of the URL. For example, suppose you have some pages that you want to be accessed at URLs directly off the site root: yourdomain.com/some-page/. But in the page list you want them to be appear under a parent for the sake of visual grouping or to declutter the page list under Home. This module identifies the virtual parents and virtual children by way of template. You define a single template as the virtual parent template and one or more templates as the virtual child templates. 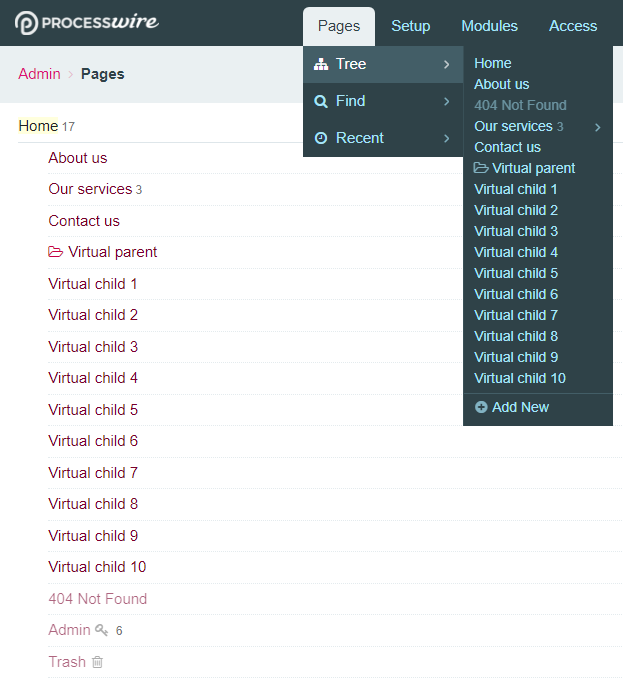 Anytime pages using the child template(s) are siblings of a page using the parent template, those child pages will appear as children of the virtual parent in the page list and tree menu. You will want to create dedicated templates for identifying virtual parents and virtual children and reserve them just for use with this module. Adjusts both page list and tree flyout menu to show the virtual parent/child structure, including the count of child pages. Works everywhere page list is used: Page List Select / Page List Select Multiple (and therefore CKEditor link dialog). 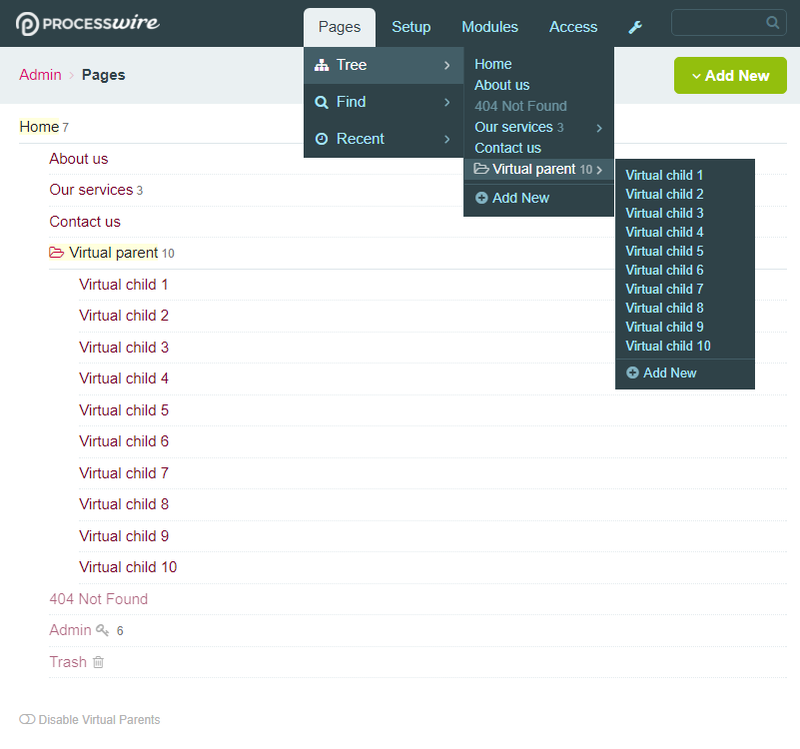 Intercepts the "Add page" process in admin, so that when an attempt is made to add a child to a virtual parent, the child is added where it belongs (the next level up) and the template selection is limited to virtual child templates. Intercepts moving and sorting pages in the page list, to ensure only virtual children may be moved/sorted under the virtual parent. Superusers have a toggle switch at the bottom of the page list to easily disable/enable Virtual Parents in order to get a view of what the real page structure is. Install the Virtual Parents module. In the module config, enter pairs of parent/child template names in the form virtual_parent_template=virtual_child_template. If needed you can specify multiple pipe-separated child templates: virtual_parent_template=child_template_1|child_template_2. One pair of template names per line. There is a checkbox in the module config to toggle Virtual Pages on and off, but it's more convenient to use this from the page list. It's important to keep in mind the real location of the virtual child pages. This module is only concerned with adjusting the appearance of page list and tree menu for the sake of visual grouping and tidiness. In all other respects the virtual children are not children of the virtual parent at all. It's recommended to select an icon for the virtual parent template (Advanced tab) so virtual parents are marked out in the page list as being different from normal parent pages. Do not place real children under a virtual parent. There is some protection against this when moving pages in the page list, but when it comes to changing a page's parent via the Settings tab the only protection is common sense. Very useful if you want to create automatic breadcrumbs via a function. I had this problem by creating child pages under a parent that should not be displayed via a real URL. The parent was only to categorize the content. But in the breadcrumbs it was displayed. In my case I solved it by categorize the children via different templates, but if you have only one template for the children, this solution will not work any longer. when opening the virtual parent to view the children, a copy of the initial tree is rendered, with just the virtual parent shown. @OviS, I just tested the module in PW 3.0.104 and it is working fine. I think perhaps you have something configured wrong - double check that you are using the format virtual_parent_template=virtual_child_template in the module config and that both your virtual parent page and your virtual child pages are at the same level in the tree when the module is disabled. Or else perhaps another module or custom hook is interfering with the Virtual Parents module? You could test the module on a clean PW installation and see if you still have the same issue. I'm converting a WP website and was using https://github.com/adrianbj/ProcessMigrator and https://github.com/nicoknoll/MigratorWordpress to import the pages from WP. The client insisted to maintain the URL structure of website.com/blog-post-here/ - hence the need for Virtual Parents to keep the page tree tidy. That's where I used Batcher to move the pages from their imported parent to the root of the website. After doing that, Virtual Parents broke. I restored a backup and tried again - this time moving the pages manually and Virtual Parents kept working fine! When trying to move the imported blog-posts manually, I noticed they were set up to have only one allowed parent - the blog-posts page (also created during the import). So basically, using Batcher, I was able to change the parent of pages to one that was not allowed through their template config. Not 100% that is was what was breaking Virtual Parents, but one definitely shouldn't be able to move pages with Batchers where they're not allowed to live. Batcher is actually @Wanze's module - I just forked it to fix a couple of PW3 compatibility issues. this time moving the pages manually and Virtual Parents kept working fine! Glad to hear that it's working for you now. When active, it seems to be limiting the number of pages displayed in the page tree to 11 children of the Home Page (of which one is the virtual parent). the new page will not appear in the tree. if you turn off virtual folders and manually sort the new page to the top, it will show, but another page will be hidden (the one at the bottom of the tree) when turning Virtual Parents back on. if you keep creating new pages under "Home" they will not be shown in the tree. @OviS, thanks for the report. Should be fixed now in v0.1.1. @Robin S Thanks for the fix! working now, but I just found another bug in 0.1.1: the virtual parent stops working if it's the 1st page in the tree (first one under Home). Otherwise, if it's 2nd or more (or "lower" in the display tree) it works perfectly. @OviS, thanks, this was just a case of fixing a conditional to account for a possible value of zero. Should be fixed in v0.1.2.